The Celebrity Standard Plus series features the classic center cut sound hole found on our beautiful Legends and Balladeers. 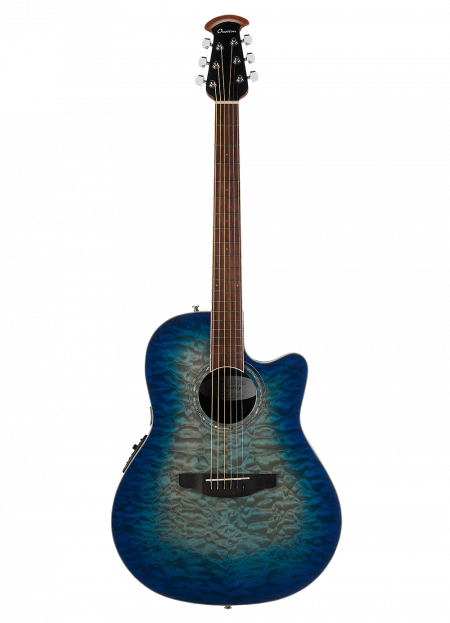 These beautiful guitars include select veneer tops, beautiful abalone appointments and first-rate sound, style and features. The top has a center cut sound hole for clear and loud resonance coupled with the Scalloped-X bracing. The top is complete with premium features that include an effortlessly playable satin-finish neck, 10”-radius rosewood fret board with 20 fully accessible frets, Pearloid inlays, and a rosewood bridge. The Celebrity Standard Plus includes an Ovation Slimline pickup and OP-4BT preamp system with three-band EQ, volume/gain control, onboard tuner and low-battery light.